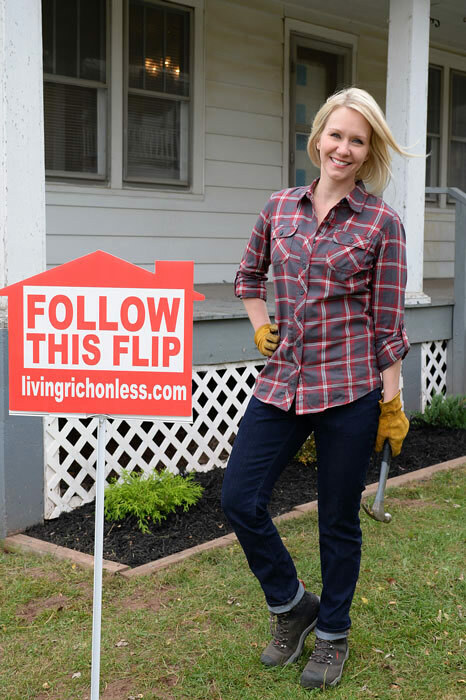 This entry was posted in Fashion & beauty, Flips, Reviews & giveaways and tagged Flip house, Follow this Flip, Real estate by Susan. Bookmark the permalink. Your flip is exciting. I’ll be living vicariously through you!! Thanks, Laurie! I’m excited to share the journey. So excited for you, and to follow your dream! Remind me your part of the country? Hope to buy a white cottage when I retire up in the cooler weather where I can have all five seasons!! A bit tired of Florida heat year round. Just found your blog and LOVE it! Will be following your flip. Hope it goes smoothly for you! Oh most definitely my comfy denim overalls. My hair in a ponytail and in a cap gets me going. Putting on my hikers and work gloves gets me going!!! Have fun on your house. I guess putting on my gloves gets me going. Yay Susan!! This is so exciting! My dream to do this one day too. Can’t wait to follow along on the progress. And love your outfit too. Flannel shirts. Because i know i’m ready to get down and dirty but look stylish doing it! I love wearing flannel, rugged and cute! putting on my paint stained jeans usually gets me moving! My paint stained jeans inspire me to do DIY projects. My work boots! They’re really old but inspire me to get to work! Best diy clothes? Pajamas! Don’t have to worry about ruining them! This is so exciting! We shall be living vicariously through your flip. I never had aa designated DIY outfit maybe that’s why I’ve always hesitated whenever I had to work on major DIY house stuff like painting. Hope to get an outfit together soon! I just throw on an old tee and knit pants! My work gloves and carpenter jeans! A warm vest and a pretty scarf! My comfy jeans get my DIY on. I’m all about boyfriend jeans when working outside. Makes it easy to slip into the rubber boots to go work on the muddy yard! Usually something comfortable, so those jeans you were talking about sound awesome! Comfy and flattering?! I’ll take it! My DIY skills are probably not in the “mojo” category, but I know it is time to get busy when I put my painting shirt on. If I win this gift card, I will dress in my new duds and I promise to sew some throw pillows. I have had the fabric for 6 months! Loving the flannel shirt not only can it be worn outside for yard work but can be worn with a pair of jeans! Where is this house located? How many bedrooms/baths? The address is 15467 Sportsman Club Road, Calvin. When done, it will be a completely renovated 3 bedroom, 2 full bath home – approx. 1400-1500 square feet. We’ll be selling for under $100,000. Are you in the market for a new home?